Every year, the Nebraska Writing Project sponsors two day-long writing festivals for students and teachers from across Nebraska. The Eastern Festival is for middle school students in grades 6-8, the Northern Festival is for grades 6-12. The goal of this initiative is to give students an opportunity to hone their writing skills in a collaborative setting and to build a community with fellow student writers. Registration includes workshops, a t-shirt, and a notebook. Registrations postmarked on or before March 8 should include a $20 fee. Cost for registrations postmarked after March 8 is $30. Contact YWF facilitator Jennifer Long at jlong@gpsne.org with questions. 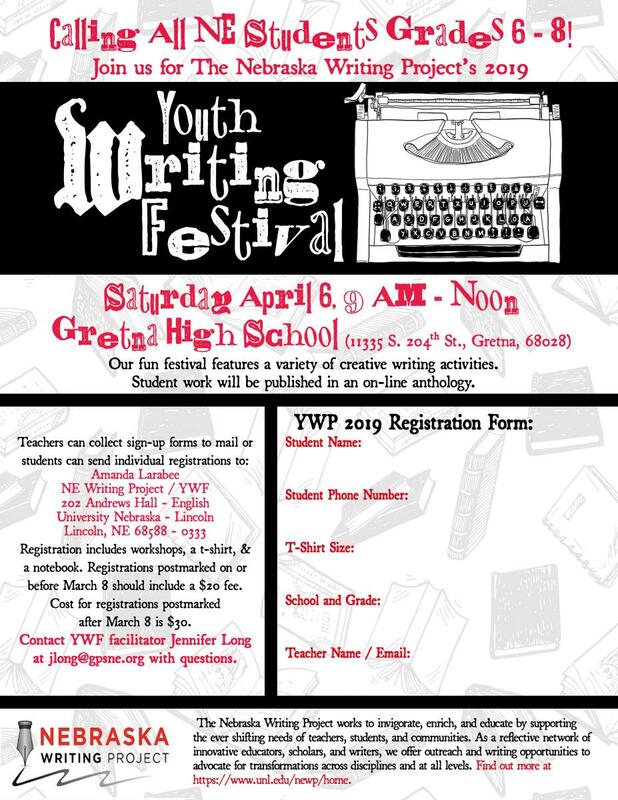 If you’d like to be involved with the Youth Writing Festivals either by bringing students or presenting, please contact the festival directors.